Moments ago at the BRIT Awards, Kanye West debuted his previously previewed “All Day,” a track that’ll most likely appear on the follow-up to the rap superstar’s upcoming Yeezus follow-up. 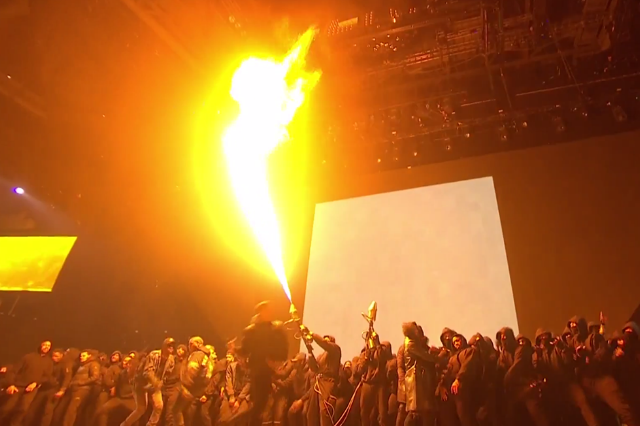 It features a chorus sung by Allan Kingdom, and in their live performance, the pair stood among a massive crowd of men wearing black hoodies, two toting flamethrowers that would erupt spontaneously. It’s a clattering track not far removed from the loudest, edgiest Yeezus cuts, and it’s absolutely awesome. Stream the live audio below and stay tuned for a video as soon as it’s uploaded.